Good food doesn’t just feed your stomach - it feeds your soul. Right now, there’s arguably no better place to feed both than a city that’s become a new player in the foodie world, and it's just south of San Diego. 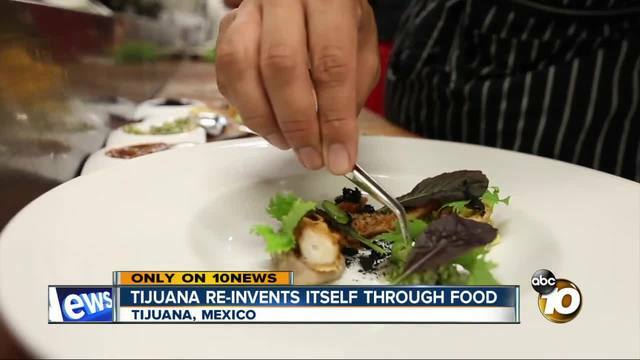 Food critics and enthusiasts have their sights set on Tijuana. For years, Tijuana has had the stereotype as a place for good tacos — something readily available nearly everywhere you look. In fact, Chef Oso Campos and his hotspot Kokopelli do it so well, that new restaurants in major U.S. cities like San Diego and Los Angeles have come calling for his help. “When they first wanted to open, they liked the idea of authentic Tijuana tacos," Campos said. "So they asked me to come and make the menu for them." These days, tacos are just the beginning. Check many a travel or food blog and you'll find that Tijuana is listed as a "must-go." The New York Times even listed Tijuana as a top destination in 2017 - prompting many to call what’s going on there a "culinary renaissance. Brassea calls it a movement and says at Humo, they’ve been feeding guests from all over the world. If you know Tijuana’s history, you know it wasn’t always this way. It was once impossible to think of Tijuana without thinking of the violence, drugs and crime. “We don’t have the best reputation, sadly, but it’s changing, and we’re helping it change,” Brassea said. Nowhere is that more evident than at upscale Mision 19 , a restaurant that's at the center of Tijuana's reinvention, with renowned Chef Javier Plascencia. Even with the progress, the people who live and work there know that the city will face more challenges. But once you’ve tried the food, you’ll believe what they believe - right now, it’s their food that’s feeding the city’s soul. If you’re nervous about traveling through Tijuana alone — or don’t know what to do with your car — there are now tours offered to help. You can park on the U.S. side of the border and ride over. The tours even take you to the breweries, another part of the food scene that’s exploding in Tijuana right now. Viator.com : A team of travel insiders help you find the best things to do everywhere you travel. Simply search "Tijuana" and you'll find everything from $65 day trips to Tijuana to $241 private helicopter tours. Baja Test Kitchen brewery tours : Book early to secure your spots for this one! The earliest tour we found is on Sunday, June 25. During the tour, you'll visit three wineries and stop for a gourmet lunch. Boca Roja Wine Adventures : The half-day walking tours of Tijuana offer stops at craft breweries, outdoor marketplaces and a hidden food truck collective. Tours go from Noon to 5:30 p.m.
Turista Libre : Itineraries take their inspiration from pastimes that few tourists get to partake in. You'll visit museums, markets, breweries and wineries.